Some of you may have seen this little set before, or perhaps you own it yourself. I came across it at BMW’s Zentrum here in South Carolina. My Dad and I went to the BMW Car Club of America Foundation’s exhibit, Heroes of Bavaria. It was a fantastic show! I don’t think I’ve shared most of my photos from there . . . Anyhow, the Foundation’s location is right around the corner from BMW so we swung by to check out the Zentrum while we were there. They always have some nice cars on display (507, anyone?) and it was good to visit again. I must say I was surprised to see this high-quality set at a very affordable price! These are exquisitely detailed models with none of the exaggerated proportions or clunky graphics of many diecast makers. I’d say they’re on the same level as Kyosho or even Schuco. Really well done. It was only $22. Also of note, the modern cab-over hauler you see here was a very cheap find from TJ Maxx or Marshall’s. 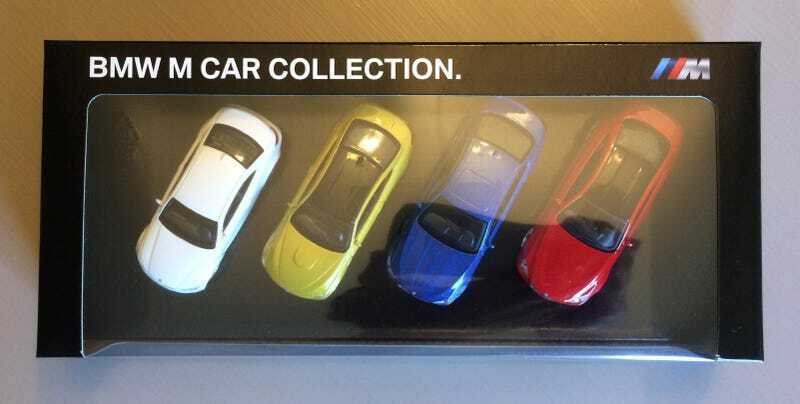 I think it was around $8 and it came with four of the ugliest little diecast cars I’ve ever seen. Anyway, I saw potential in the truck and I’m so glad I bought it! I love the individual wheel designs unique to each car! look at the surfacing on that hood! I weathered and oil-stained the hauler along with adding some hydraulics. I know they’re not super-accurate, but I wanted to make it look better without impeding the movement of the ramps. 4 factory-stock M’s, but there’s always that one guy who can’t leave well enough alone . . .
You can actually fit 7 good-sized vehicles on here. This shows the truck pre-weathering. Picture found online, similar to the hauler I bought, but with more cars and accessories. Dickie Toys.